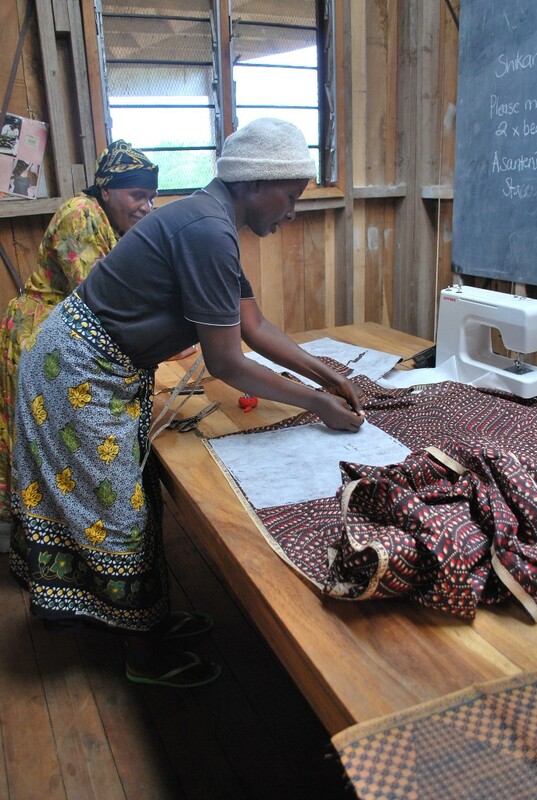 Last month I was lucky enough to host two more sewing workshops for the mamas from the Kesho Leo childrens village run by Food Water Shelter (FWS) in Arusha, Tanzania. The day before the first class, I went fabric shopping to choose the fabrics we would work with. 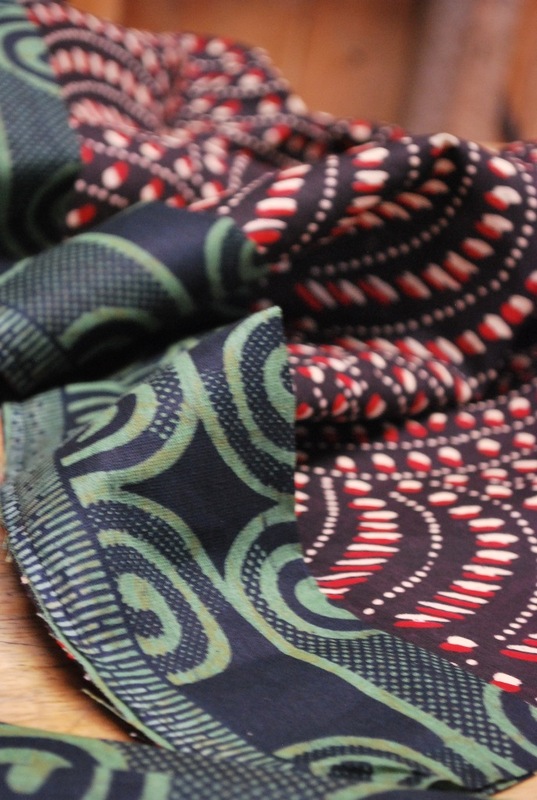 I selected three vitenge, and ended up donating an extra one as well – the chicken one. I had bought another one very similar to it without realising. The mamas loved it, as it was a very good quality wax print. There were lots of exclamations of “weksi! nzuri sana!” (wax, very beautiful!) and they all wanted to keep it! The project for the day was a gorgeous skirt designed by Dressed for Sunday who very generously donated the pattern (you can find them for sale here: http://www.madeit.com.au/storecatalog.asp?userid=2379) . 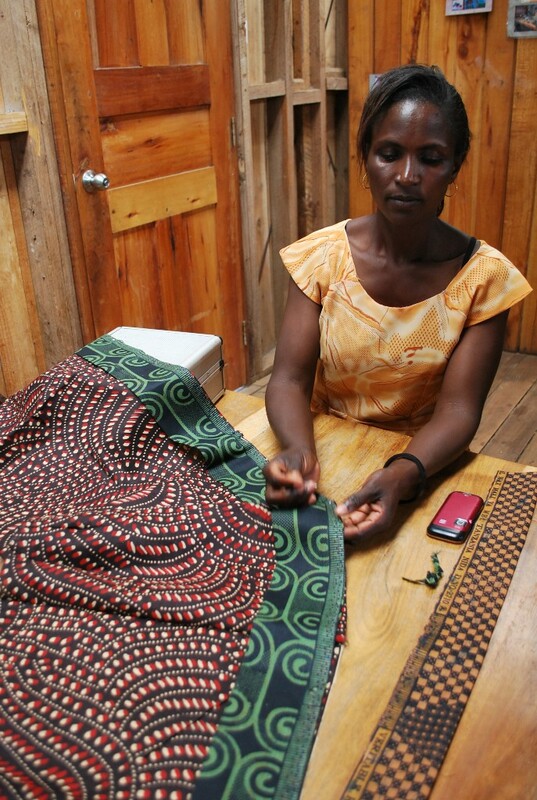 It is a knee length wrap skirt in contrasting fabrics, which turned out beautifully using African kitenge. I have to thank my good friend Karen and her Mum who, on my 8 hour stopover in Melbourne on route to Africa, helped to put together the pattern PDF and trace it onto a sturdy type of paper. When I say ‘helped’ I actually mean they practically did it all for me while I attended to my sick little boy, so asante sana to them both. Unfortunately all the mamas could not be there on this day, but I did get to work with Helena, Sherida, Mary, Eliza, and Bibi Frank. 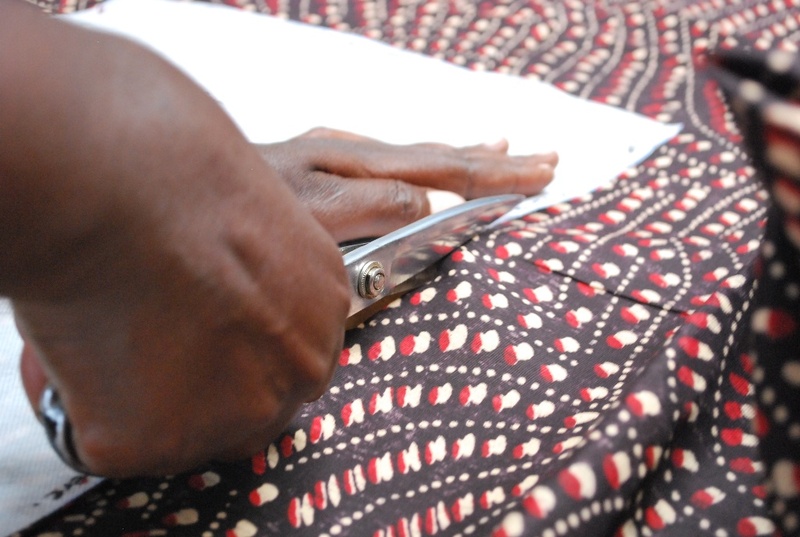 I am happy to say they learnt some new skills that afternoon; working with patterns, how to sew darts, and how to do a french seam. 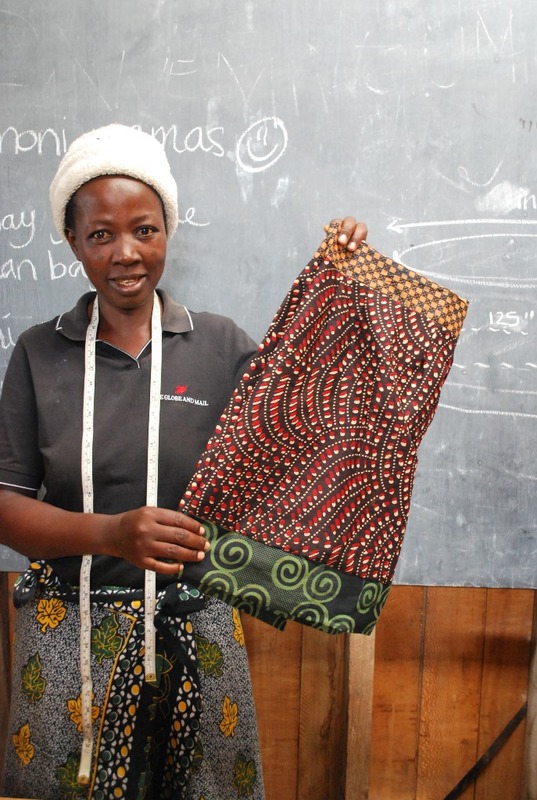 And they were very proud of the results, a very cute skirt which they will make more of, and will sell them to the tourist market to raise funds for FWS. Here are some photos from the day..
One new skill learnt was how to read basic pattern markings, like the grain line and dart markings. 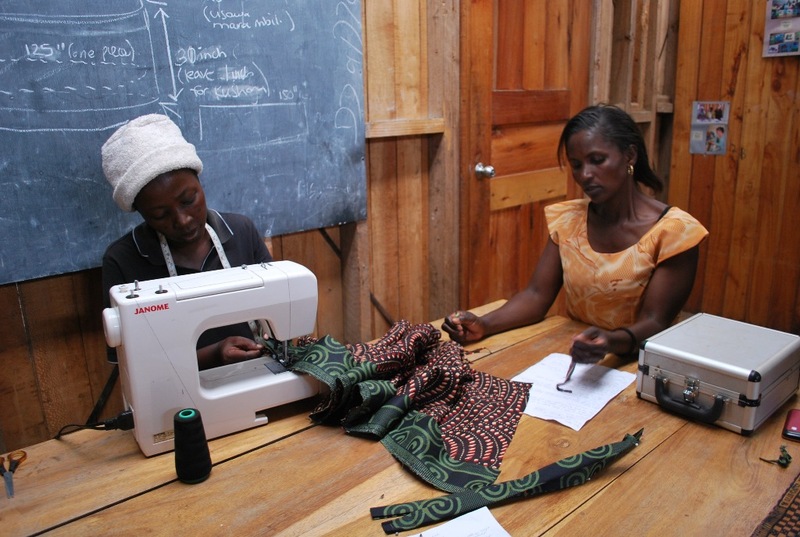 We were lucky to be able to use electric sewing machines, thanks to the awesome solar power installed in 2010. Previous to that the only option was to use foot powered treadle machines. Helena with the finished skirt! lovely lovely lovey….i cant just stop reading your posts….i really wish to contribute more than just reading your posts and leaving a comment. Please do let me know. I am an artist myself and also a craftsperson too. How about putting a post on how u think others can contribute.